Alonzo T. Jones | My Gospel Workers | "Redeeming the Time"
How to Make . . .
At age 20, A. T. Jones began three years of service in the Army. Interestingly enough, he spent much of his time pouring over large historical works, SDA publications, and the Bible. He was baptized when he left the Army, and began preaching on the West Coast. 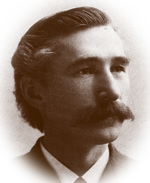 In May, 1885, he became editor of the Signs of the Times, and was later joined by E. J. Waggoner. In 1888, these two men stirred the General Conference session in Minneapolis with their preaching on righteousness by faith. For several years thereafter, they preached on that subject from coast to coast. Ellen White accompanied them on many occasions. She saw in Jones’ presentations of “the precious subject of faith and the righteousness of Christ…a flood of light” (EGW 1888 Materials, p. 291). Jones was on the General Conference Committee in 1897 and editor-in-chief of the Review and Herald from 1897 to 1901. In 1889, with J. O. Corliss, he spoke against a bill in the U.S. Congress on Sunday observance; the bill was defeated. Thereafter he was a prominent speaker for religious freedom, serving as editor of the forerunner of the Liberty magazine. After being president of the California Conference (1901-1903), he joined Dr. J. H. Kellogg’s staff against the counsel of E. G. White, a move which after a series of unfortunate misunderstandings and unwise choices, led to his separation from denominational employment and loss of church membership. Jones remained a Sabbath observer and loyal to most of the other doctrines of the church. He is remembered especially for his part in bringing into prominence the doctrine of justification by faith. This program is my church service. I learn so much. Thank you. I know every time that I listen I have to have my Bible, because Pastor Perch goes through at least 20 or more verses every time. I listen to the program every week! I listened to the broadcast last week on the radio. I was blessed. Pastor Perch made the study very easy. Almost Christians, yet not fully Christians, they seem near the kingdom of heaven, but they cannot enter there. Almost but not wholly saved, means to be not almost but wholly lost.